Dr. Ian Santoro grew up in Massachusetts. He received his B.A. from Harvard University in Cambridge, MA in 1980. He received his medical degree from Columbia University College of Physicians and Surgeons in New York, NY. He completed his Internal Medicine Residency and Cardiology Fellowship at the University of Chicago. He then completed a Cardiac Electrophysiology and Pacemaker Fellowship at the University of Oklahoma Health Sciences Center. 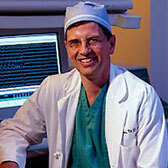 Dr. Santoro is board-certified in Internal Medicine, Cardiovascular Diseases, and Cardiac Electrophysiology and Pacing. His practice includes clinical cardiology and cardiac electrophysiology. His area of expertise is the treatment of patients with cardiac arrhythmias, or heart rhythm disorders, including the management of patients with pacemakers and cardiac defibrillators. Dr. Santoro’s primary interest is radiofrequency catheter ablation, a curative procedure for rhythm disorders, with a special interest in ablation of atrial fibrillation and implantation of the Boston Scientific Watchman device. He works primarily at St. Peter’s Hospital and secondarily at Albany Medical Center in Albany, NY. Dr. Santoro is married to Carol R. Santoro, MD, and has two children. Santoro IH, Lang RM, “Iatrogenic Air Embolism Causing the Adult Respiratory Distress Syndrome”. Catheterization and Cardiovascular Diagnosis. 1989; 17:84-86. Nakagawa H, Beckman K, McClelland J, Wang X, Arruda M, Santoro IH, et al. “Radiofrequency Catheter Ablation of Idiopathic Left Ventricular Tachycardia Guided by a Purkinje Potential”. Circulation. 1993:88: 2607-17. “Cardiovascular Performance in Dialysis Patients Before and After Correction of Anemia with RHuEPO”. Fellner S, Santoro IH, Lang R, Neumann A. American Society of Nephrology, December 1990. “Use of Erythropoietin to Assess the Pathophysiologic Mechanisms Regulating the High Cardiac Output State of Chronic Anemia.” Santoro IH, Neumann A, Borrow K, Fellner S, Lang R. Journal of American College of Cardiology, March 1991. “Effect of Skin-Patch Location and Surface Area on Impedance During Radiofrequency Catheter Ablation”. Santoro IH, Wang X, McClelland J, Beckman K, Oren J, Arruda M, Roman C, Nakagawa H, Hirao K, Lazzara R. North American Society of Pacing and Electrophysiology, May 1992; PACE 1992:15:580. “ECG Algorithm for Predicting Radiofrequency Ablation Site in Posteroseptal Accessory Pathways”. Arruda M, Wang X, McClelland J, Beckman K, Santoro IH, Oren J, Roman C, Lazzara R, Jackman W. North American Society of Pacing and Electrophysiology, May 1992; PACE 1992: 15:535. “Sites of Successful Radiofrequency Ablation of Posteroseptal Accessory Pathways”. Wang X, Jackman W, McClelland J, Beckman K, Roman C, Oren J, Santoro IH, Arruda M, Nakagawa H, Hirao K, lazzara R. North American Society of Pacing and Electrophysiology, May 1992; PACE 1992, 15:535.